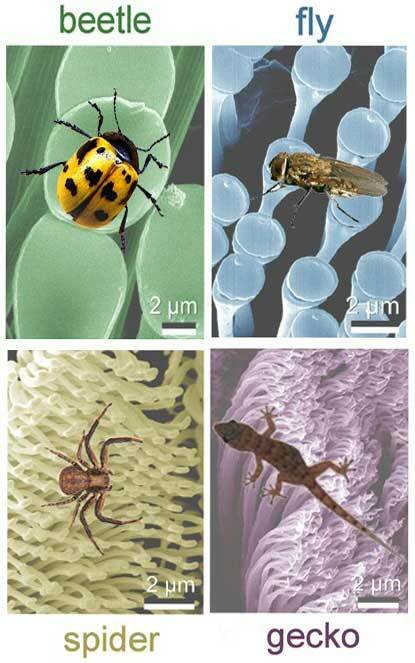 (Nanowerk Spotlight) Animals that cling to walls and walk on ceilings owe this ability to micro- and nanoscale attachment elements. The highest adhesion forces are encountered in geckos. A gecko is the heaviest animal that can ‘stand’ on a ceiling, with its feet over its head. This is why scientists are intensely researching the adhesive system of the tiny hairs on its feet. On the sole of a gecko’s toes there are some one billion tiny adhesive hairs, about 200 nanometers in both width and length. These hairs put the gecko in direct physical contact with its environment. The shape of the fibers is also significant; for example, spatula-shaped ends on the hairs provide particularly strong adhesion. Researching how insect and gecko feet have evolved to optimize adhesion strength is leading to bio-inspired development of artificial dry adhesive systems. Potential applications – apart from every comic fan's dream of Spiderman gloves – range from protective foil for delicate glasses to reusable adhesive fixtures – say goodbye to fridge magnets, here comes the hairy stuff, which will also stick to your mirror, your cupboard and your windows. Researchers at the Max Planck Institute for Metals Research in Stuttgart/Germany have explored the extraordinary adhesion force of gecko feet for some time now. Back in 2004 they discovered that there exists an optimal shape of the contact surface of the tip of such hairs which gives rise to optimal adhesion to a substrate via molecular interaction forces ("Shape insensitive optimal adhesion of nanoscale fibrillar structures"). For macroscopic objects, such optimal shape design tends to be unreliable because the adhesion strength is sensitive to small geometrical variations. It is shown that this limitation can be remedied via size reduction. The key finding of this research is that there exists a critical contact size around 100 nanometers below which optimal adhesion can be reliably achieved independent of small variations in the shape of the contact surface. 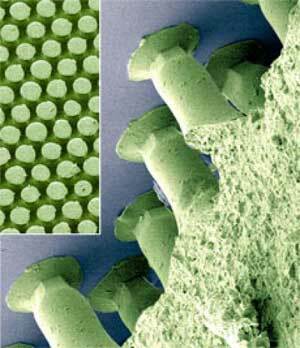 In general, optimal adhesion can be achieved by a combination of size reduction and shape optimization. The smaller the size, the less important the shape. This result provides a plausible explanation why the characteristic size of hairy attachment systems in biology fall in a narrow range between a few hundred nanometer and a few micrometers and suggests a few useful guidelines for designing adhesive structures in engineering. Continuing this research, in 2005 the Max-Planck researchers discovered that the adhesiveness of geckos increases with the amount of humidity ("Evidence for capillarity contributions to gecko adhesion from single spatula nanomechanical measurements" and "Resolving the nanoscale adhesion of individual gecko spatulae by atomic force microscopy"). Its foot's adhesive system, whose branches become increasingly smaller over three levels, allows the gecko to stick to just about any ceiling and walk with its feet over its head. Until then, scientists were uncertain as to what mechanism was responsible for the extreme adhesive ability of the gecko. What was clear is that the adhesive system was ‘dry’ – in other words, that it functioned without secreting anything of its own. Instead, it uses water, which is present as a thin film on every terrestrial surface. The researchers found that as humidity increases, the capillary forces strengthen and that ultra-thin water layers, like those between a gecko spatula and a substrate, influence the strength of adhesive forces. Copying the biological adhesive mechanism, the Max-Planck scientists used the insights gained from their years of research to develop a material with a biomimetic structure that exhibits excellent adhesive qualities. The special surface structure of the material allows it to stick to smooth walls without any adhesives. Potential applications range from reusable adhesive tape to shoe soles for climbing robots and are therefore of considerable relevance to technology. In rigorous tests carried out by the Max Planck researchers with measuring instruments developed especially for the purpose, the artificial adhesive system gave an impressive performance and demonstrated many benefits. It lasts for hundreds of applications, does not leave any visible marks and can be thoroughly cleaned with soap and water. The researchers found that five square centimeters of the material can hold objects weighing up to one hundred grams on walls. However, this limit is much lower for ceilings. Smooth structures, such as glass or polished wood, are good bases but woodchip wallpaper is not very suitable. "Insects also find it difficult to travel over slightly roughened surfaces – it's a fundamental problem for adhesion mechanisms," explained Project Leader Stanislav Gorb from the Evolutionary Biomaterials Group at the Max-Planck-Institute for Metals Research. To manufacture the material, a mold, similar to a cake tin in baking, is used in which the required surface is embossed as a negative image. The mould is filled with a polymerizing mixture which is allowed to cure and then released from the mould. This sounds easy, but is the result of a "great deal of trial and error." The researchers found the construction of the microstructural "cake tin" particularly challenging and exactly how it works remains a trade secret. Optimizing the polymer mixture also taxed the researchers: if it is too fluid it runs out of the mold; if it is too viscose, it won't even go in. Potential applications range from protective foil for delicate glasses to reusable adhesive fixtures. For example, the new material will soon be found in industrial production processes in the manufacture of glass components. It has already been shown to perform in higher weight categories: the artificial adhesive fibers on the soles of a 120 gram robot helped it to climb a vertical glass wall ("Climbing and Walking Robots : Proceedings of the 8th International Conference on Climbing and Walking Robots and the Support Technologies for Mobile Machines". In their current research, the scientists are trying to improve the adhesion by refining the structures even further. "However, there's still a lot of work to be done. Something that functions smoothly in the laboratory is a long way away from large-scale production," explained Stanislav Gorb.